Here are a few of my ‘pets’. 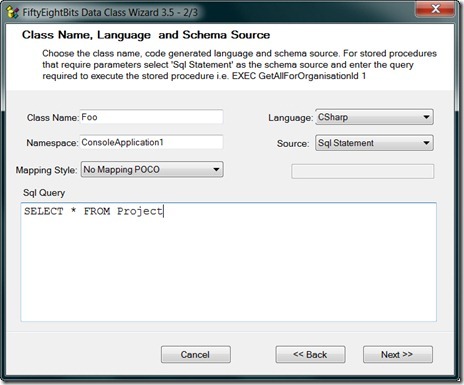 This was an early attempt of mine at writing a Visual Studio Add-in - designed to create a class from a database query, table or stored procedure. There’s a ton of stuff like this out there – but I wanted something that generated the class from the DataTable – SchemaTable of an IReader – so that a class could be generated from any query or shape for use with DTOs, reporting, or a simple domain model. You can choose from C#, VB or C++ to generate the class as well as a number of styles of classes – from a built-in IReader constructor, attribute based mapper, or plain old CLR object (POCO). There also doesn’t have to be any data in the result set for this to work since the SchemaTable will be returned regardless. The Add-in also adds an ‘Open Folder’ option to the context menu of all solutions, projects, folders, etc. in Solution Explorer. This feature exists as of VS 2008 – but I wanted it at the top of the context menu – not at the bottom. You can download the Add-in here at - FiftyEightBitsAddin.zip Just unzip and place the contents of the zip file into any one of the Add-in locations for VS2008. 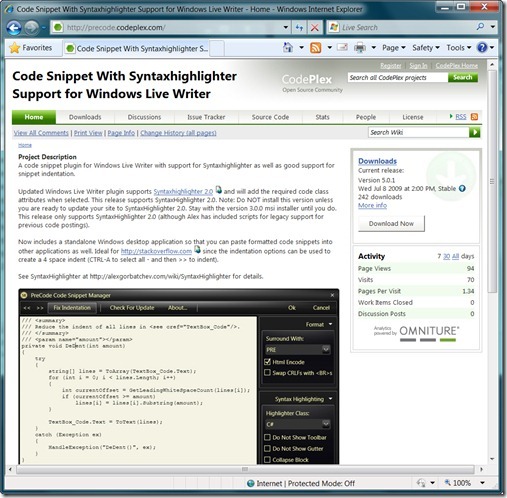 This is an open source project hosted at Codeplex – a plugin for Windows Live Writer that helps to format code snippets before pasting them into a blog post (or elsewhere). It was written for the excellent SyntaxHighlther from Alex Gorbatchev. It’s a WPF app – and also includes a standalone desktop version for pasting formatted code into any app (ideal for Stack Overflow). Please don’t look at this as a reference WPF app though – it’s more than just a little ‘hacky’. The app that follows is my ‘better’ WPF effort. Visit http://www.codeplex.com/precode for more details, the source code and the installer. If you follow the Photos link above – you’ll see the results of this application. 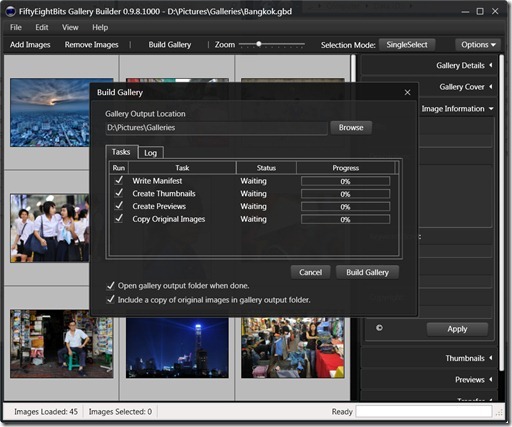 Yet another gallery builder app – however I’ve spent a bit of time on this one – choosing a specific architecture that I think represents a good balance between desktop and web server processing for small to medium size collections of photos. I’ll be hosting a Wiki soon with docs and the full download including the HttpModule that is used display galleries online (along with a sample app and extensibility features). The module can be integrated into any site and includes full Atom and Rss syndication support, nested galleries, as well as good caching/304 response support. A pre-release version of the desktop application can be downloaded from the link below (although it’s not a whole lot of good without the web component). Hand rolling a complete set of control templates for a custom theme in WPF was a great way to get to know the inside of WPF. NOTE: If there are no other WPF apps on your machine – and this application is the first WPF application you start – the ‘cold’ loading time for a WPF app is very long. Subsequent application loading times are what you’d expect. Yet another task/project list manager; only I actually use this one. This is an ASP.Net Model View Presenter application (and hopefully my last Webforms app). 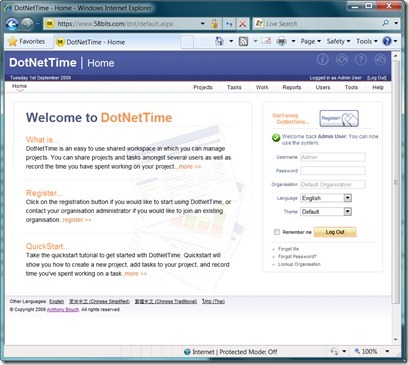 I use this to track my own time working on projects or just to ‘monitor’ my own time in general. Implementing multi-language support was a good learning exercise – and until recently this had been my ‘workbench’ throw anything at it hobby app. Now that charting controls are available free from Microsoft – I’ll be adding some charts to the reporting page. Feel free to register and have a play – it’s very basic – but it does what I need. Be gentle too if you’re into web hackery– this was built before my formal introduction to the world of application security and so I wouldn’t be surprised at all if there were XSS or CSRF vulnerabilities (although there shouldn’t be any SQL injection weaknesses – he says).